The scientists of showbiz. Magic has enchanted humankind for millennia, evoking terror, laughter, shock and amazement. Once persecuted as heretics and sorcerers, magicians have always been conduits to a parallel universe of limitless possibility – whether invoking spirits, reading minds, or inverting the laws of nature by sleight of hand. Long before science fiction, virtual realities, video games, and the Internet, the craft of magic was the most powerful fantasy world man had ever known. As the true pioneers of special effects in human history, magicians have never ceased to mystify by perpetually making the impossible possible. 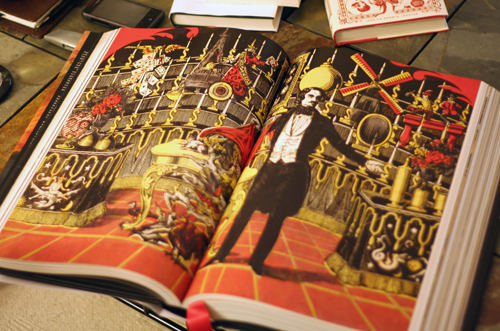 This book celebrates 500 years of the dazzling visual culture of the world’s greatest magicians. Featuring over 1,000 rarely seen vintage posters, photographs, handbills, and engravings in one 640-page volume, it traces the history of magic as a performing art from the 1470s through the post-WWII years. 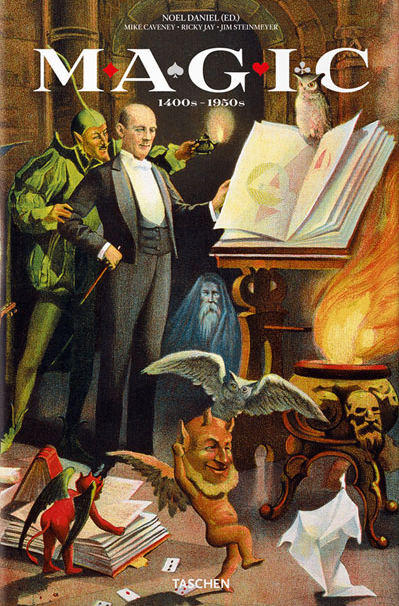 Through sensational images and clear and insightful accompanying text, “Magic” explores the evolution of the magician’s craft, from its early street performers to the brilliant stage magicians who gave rise to early cinematic special effects; from the 19th century’s “Golden Age of Magic” to groundbreaking daredevils like Houdini and the vaudevillians of the early 20th century. I bought Taschen’s giant circus book when revising Pantomime (see review here). I found it incredibly helpful and really wanted this book, but damn if it wasn’t expensive. When I got my book deal, my husband bought it for me as a congratulations present for my sequel. Well-played, husband, well-played. I thought the Circus book was big. This one is even more gigantic–clocking in at 16 pounds and around 650 oversized pages. I could weight-lift with this thing. I could hit someone with it and do some serious damage. As with the Circus book, each Chapter was in English, German, and French, along with all the captions of the photos. The essays are well-written and give insight into overarching trends in the history of magic. So many magicians had different personalities and styles. This book touches on both the ones well-remembered today–Houdini, Thurston, Kellar, Carter–and some of the lesser-known ones, like Ionia. The lithographic posters are extraordinarily lovely, and some have two-page spreads. Some of them are quite rare. This book is absolutely gorgeous, and if you’re a magic afficianado, it’s a must-read to have a clearer idea of how magicians have evolved over the years to reflect the cultural zeitgeist. Through the years, we’ve grown more cynical, and the audience became increasingly aware that magicians were fooling us, but enjoying the tricks all the same. Want to see more magic stuff? Check out my Pinterest boards – Magic Posters and Magic Photography.